Elizabeth, 43, struggled to send her four children to school and feeding them regular meals was a challenge before she received the grant. 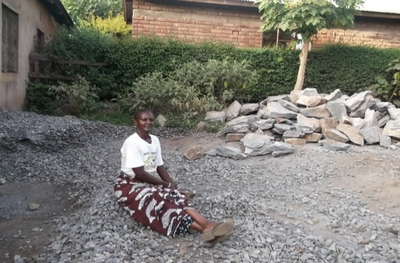 In 2012 she received a grant to set up a business making and selling gravel to be used to surface roads. Last year she received a loan which has enabled her to start selling maize and beans at the market as well. Now, when there is no market, she continues with her gravel business. She has invested her profits to send her children to school and hopes this will enable them to find good jobs. She has also invested in a chicken project, a goat and a cow to help provide her family with food. She has also been able to sell any extra produce. If you would like to help support more women like Elizabeth, we are currently raising funds for our next round of grants and loans. To help us achieve our target you can donate here.